Metabotropic glutamate-5 receptors (mGluR5), which physically and functionally interact with N-methyl-d-Aspartate (NMDA) receptors, likewise control cognitive processes and have been proposed as targets for novel classes of antipsychotic agent. 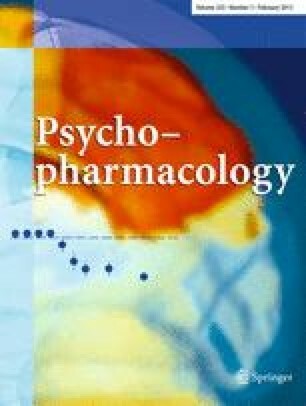 Since social cognition is impaired in schizophrenia and disrupted by NMDA receptor antagonists like dizocilpine, we evaluated its potential modulation by mGluR5. Acute administration (0.63–40 mg/kg) of the mGluR5 positive allosteric modulators (PAMs), 3-cyano-N-(1,3-diphenyl-1H-pyrazol-5-yl)benzamide (CDPPB) and ADX47273, reversed a delay-induced impairment in social novelty discrimination (SND) in adult rats. The action of CDPPB was blocked by the mGluR5 antagonist, 2-methyl-6-(phenylethynyl)-pyridine (2.5–10 mg/kg), and was also expressed upon microinjection into frontal cortex (0.63–10 μg/side), but not striatum. Supporting an interrelationship between mGluR5 and NMDA receptors, enhancement of SND by CDPPB was blocked by dizocilpine (0.08 mg/kg) while, reciprocally, dizocilpine-induced impairment in SND was attenuated by CDPPB (10 mg/kg). The SND deficit elicited by post-natal administration of phencyclidine (10 mg/kg, days 7–11) was reversed by CDPPB or ADX47273 in adults at week 8. This phencyclidine-induced impairment in cognition emerged in adult rats from week 7 on, and chronic, pre-symptomatic treatment of adolescent rats with CDPPB over weeks 5–6 (10 mg/kg per day) prevented the appearance of SND deficits in adults until at least week 13. In conclusion, as evaluated by a SND procedure, mGluR5 PAMs promote social cognition via actions expressed in interaction with NMDA receptors and exerted in frontal cortex. MGluR5 PAMs not only reverse but also (when given during adolescence) prevent the emergence of cognitive impairment associated with a developmental model of schizophrenia. We would like to thank Alain Gobert and Kevin Fone for helpful discussions and comments on the manuscript. Nicholas E. Clifton, Nadège Morisot, Sylvie Girardon, Mark J. Millan and Florence Loiseau declare that, except for income received from their primary employer, no financial support or compensation has been received from any individual or corporate entity and there are no personal financial holdings that could be perceived as constituting a potential conflict of interest. The contribution to this work made by Nicholas E. Clifton, Nadège Morisot, Sylvie Girardon, Mark J. Millan and Florence Loiseau was financially supported by Servier. Horio M, Fujita Y, Hashimoto K (2012) Therapeutic effects of metabotropic glutamate receptor 5 positive allosteric modulator CDPPB on phencyclidine-induced cognitive deficits in mice. Fundam Clin Pharmacol. doi: 10.1111/j.1472-8206.2012.01045.x.